Anthropologist and systems theorist. Co-author of the theory of the ‘double bind’, an important influence on the anti-psychiatric understanding of schizophrenia. Bateson addressed the congress on the subject of ‘conscious purpose versus nature’, offering a cybernetic approach to the world’s problems. American actor, poet and joint founder of The Living Theatre, whose Mermaid Theatre production of The Brig (1964) was particularly influential on London’s avant-garde. Beck and his wife Judith Malina were very close to Joe Berke during the early sixties, enrolling him and Paul Goodman in a ‘General Strike for Peace’ and other anarchic and poetic activities. An unusual man of extraordinary dramatic and intellectual power. American anti-psychiatrist, poet and radical educator; the main organiser of the congress. Berke’s arrival in London during the autumn of 1965 brought a ‘hip’ lower east side sensibility to Kingsley Hall, broadening further its appeal to artists and politicos. The congress nexus; a boundlessly energetic man committed to revolutionising contemporary existence. Black Power leader and chairman of the Student Non-Violent Coordinating Committee (SNCC); the main activist at the congress. Carmichael’s first presentation on 18 July followed massive rioting in Newark, New Jersey, and sparked fears of similar insurrections in Notting Hill and other ‘black’ areas of London. His contribution to the Open Forum session on 22 July was one of the dramatic high points of the congress, involving spars with Allen Ginsberg and robust exchanges with the audience. Carmichael was invited by Berke’s colleague, Leon Redler, who had himself been involved in civil rights issues before moving to England. A young shaman, says Ginsberg. South African psychiatrist, and a co- founder of the Institute of Phenomenological Studies. Cooper’s Villa 21, a pioneering ward for the ‘treatment’ of schizophrenia, was an important influence on Kingsley Hall and by extension on Joe Berke, the main organiser of the congress. An articulate, quietly spoken man, he was devoted to Laing, Sartre and Michel Foucault, whose Madness and Civilisation he introduced to English and North American readers. He described himself during his presentation on 29 July as a ‘deracinated white intellectual’. Later, he edited The Dialectics of Liberation for Penguin, an anthology of congress speeches. French philosopher and sociologist. Goldmann delivered far and away the most ‘academic’ lecture at the congress, speaking on the subject of ‘criticism and dogmatism in literature’. Veteran anarchist and polymath; editor of Liberation and author of Community of Scholars (1962) and other works on radical education. First introduced to Laing in Washington in 1964. Afterwards, Laing wrote: ‘He is a real puritan, all for morality and hope and against exstacy (sic.) and drugs of pretty well all kinds.’ Goodman’s presentation, ‘Objective Values’, delivered on 25 July, was generally considered one of the most successful of the congress. In journalist, Roger Bernard’s words: ‘Communication was back, with a vengeance.’ His words seem like wise common sense now. Deeply engaged with finding the good life in community. Like Ginsberg, openly homosexual. Actor and co-founder of the San Francisco Diggers, pioneers of ‘free food’ and other anarchic enterprises. He fooled the audience by delivering one of Hitler’s speeches as his own. A provocative and unassimilable presence. Sociologist, economist and anthropologist at the university of St. Louis. Author of Culture against Man (1963), a book about the United States – ‘its economic structure and values, and the relation of these to national character, parent-child relations, teenage problems and concerns, the schools, and to emotional breakdown, old age and war.’ Henry was a profound influence on Berke and R.D. Laing, who both learned much from his studies of schooling and schizophrenia. His congress paper ‘Social and Psychological Preparation for War’ was delivered on the morning of 19 July, the day after Carmichael’s. Anthropologist; son of Julian and nephew of Aldous Huxley, one of the so-called ‘forefathers’ of flower power. Huxley was invited to the congress at the suggestion of Laing, whose interests he shared. Author of The Invisibles: Voodoo Gods in Haiti (1966), and an expert on shamanism. A teller of tales; assured, sharp and witty. Charismatic and mercurial Scotsman, whose The Divided Self (1960) and The Politics of Experience and the Bird of Paradise (1967) influenced many congress participants. Cat-like behind his shades; at times, impenetrable. A close colleague of David Cooper and a mentor to Joe Berke and Leon Redler. His congress presentation ‘The Obvious’ argued inter alia that violence was ‘institutionalised’: ‘We need to catch up on the normal psychological correlates of the normal state of affairs, of which Vietnam in only one of the most obvious normal manifestations.’ Some of the planning for the congress took place at his flat in Belsize Park Gardens, where he lived with his German girlfriend, Jutta Werner. White-haired German philosopher and activist; the father figure of the congress. Author of One-Dimensional Man (1964) and other works of political philosophy. His presentation, delivered on 28 July, advocated ‘liberation’ from the affluent society, raising the flag for the hippies, who had been denounced by Carmichael and Gerassi as ineffective. ‘As he finished speaking, Joe Berke stood up and handed him a small flower.’ A key influence on the student New Left at the congress. Auto-destructive artist and a crucial figure in the cultural landscape of the 1960s, linking auto-destructivism and thus violence with Kingsley Hall and later anti-psychiatric developments. With poet John Sharkey, he organised the Destruction in Art Symposium (DIAS) of September 1966, at which Berke delivered a lecture on mankind’s urge to destroy itself. A gentle, unassuming man, friendly with Carolee Schneemann and many other congress particpiants. American anti-psychiatrist; a close friend of Joe Berke; and one of the four founder members of the Institute of Phenomenological Studies (IPS). Redler was educated at Albert Einstein College, N.Y., and then at Maxwell Jones’s Dingleton Hospital - like several other American anti-psychiatrists with links to Kingsley Hall and the organisation of the congress. An important peace activist on campus and committed to civil rights, Redler brought to the congress a keen eye for some of its more modish absurdities. A thoughtful man deep in Zen; quiet, troubled, observant. Performance artist and filmmaker. An anomalous presence at the congress. Her happening ‘Round House’ survived sabotage and censorship to offer a comprehensive critique of the congress participants. American poet, founding editor of Ikon magazine and one of the very few influential women at the congress. Sherman contributed to a seminar on art and violence with poet Jerome Rothenberg and artists Gustave Metzger and Carolee Schneemann and wrote an account of the congress for Ikon. From the Lower East Side, like many Americans at the congress. Canadian pioneer in family therapy and a friend of Laing since 1962. Speck replaced Erving Goffman, the profoundly influential author of Asylums (1961), who withdrew a few weeks before the congress opened. Marxist economist and sociologist. Author of Monopoly Capital (1966) and editor of Monthly Review. His congress presentation argued that the communist revolutions of the twentieth century were the result of an ‘inevitable struggle’ against the ‘straitjacket of the international capitalist system.’ A speaker patrician in manner and delivery. 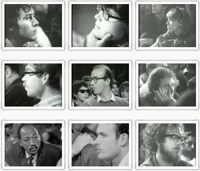 Please help us identify audience members from the 1967 Dialectics Photobook.